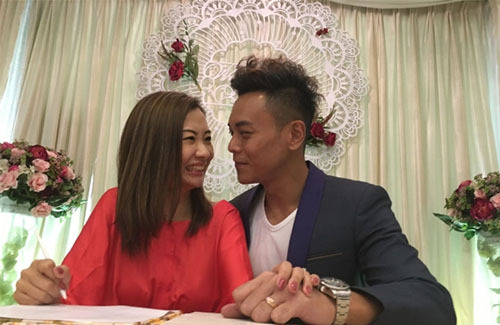 TVB actor Eric Li (李天翔) and his girlfriend of six years, BoBo Tam (譚寶怡), have tied the knot! The couple took their relationship to the next level last week, when they signed their marriage certificate at their lawyer’s office. In a short ceremony, the couple cutely brushed their noses against each other and recited their vows. BoBo was in tears. Eric acted well in OCTB. He needs to explore more opportunities outside of TVB. His talent is wasted there. Congratulations to Eric Li and Bobo Tam. May you 2 have a very happy and loving future.